What would the world look like in 30 years, if we successfully achieve our conservation goals? When we (the class of Biodiversity, Conservation and Management at Oxford University) were asked this question, many of us were unable to imagine more than a cartoon caricature of the future. This was a surprising wake-up call. As active conservationists, we need a tangible goal to set our sights on. So we decided to reconnect with our emotions, values and hopes for conservation, dedicating a whole workshop to that one, seemingly simple, yet surprisingly elusive question. It was important to create a space to explore this in a blue skies, positive way. This meant actively putting aside our well-trained pragmatism hats for once. Pragmatic realism is a way of thinking that both enables and encumbers. It favours practicality and working with the ‘facts of life’, which granted, facilitates the development of real-world solutions, but it can often feel as though we are not taking a proactive stance in shaping the future. By taking the time to project forward and embrace the positive, we were able to refresh our ambitions and build a tangible set of conservation goals that we can turn to in the future. One which we can use to inspire ourselves when the challenges seem too big. The workshop itself was broken down into two sessions, the first involving guided meditation, creative expression and discussion. The second allowed us to pull out emerging themes and run break-away groups on key topics. In this way we brought the exploration back to ourselves. We asked what role could we have played in achieving our goals, or ‘how did we do it?’, for which we gathered an assortment of practical steps. Participants getting creative with their visions and presenting back to the group. The first meditation began by imagining a day in our lives, 30 years into the future. This was guided by prompts related to emotions and the senses, in an attempt to characterise the world in a physical way. It went a little like this: You’ve woken up, what can you hear? Can you smell anything? If you get up and go outside, what can you see? What temperature is it? If you’re heading somewhere, where are you going, and how are you getting there? And so on.. This was followed by a broader scale meditation on “What would the world at large look like 30 years into the future now that you have achieved all your conservation goals?”, considering how the bigger conservation picture could have changed in our lives. 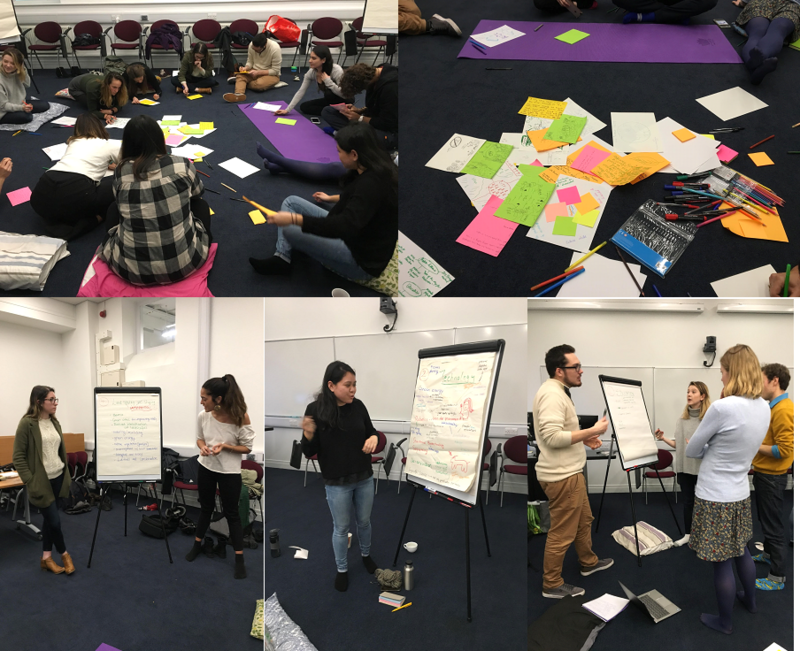 From behavioural change and interactions with nature, to government structures, news stories and engagement with technology, we took the time to develop a picture in our heads, before feeding back to the group. We expressed our thoughts on paper after both exercises by drawing pictures, writing prose and creating mind maps, laying them in the middle for the group to explore. We each then chose one or two words to summarise the creative pieces, culminating in: Food, respect, integration, nature, beauty, equality, technology, community, green education, living and land sharing vs. sparing. Now we had some idea of what we wanted the world to look like, we saw four key areas emerge – education, community, technology and integration. From this, we divided into groups, put back on our pragmatic hats, and went to work outlining the steps we could proactively take as young professionals to work towards our goals. To find out more about our thoughts, check out the word clouds below! It was interesting to notice that in order for us to imagine our conservation futures, we ended up exploring issues that on the face of it, seemed unrelated to conservation but which we realised were fundamental to our practice. Participants raised issues such as equality and diversity of participation within the conservation community, political literacy and better engagement with people from outside our discipline. We concluded by reflecting on the inter-disciplinary nature of the conservation movement and the need to make it accessible to people from a range of backgrounds. Although we each had a unique answer in our heads to the question “What would the world look like in 30 years, if we successfully achieve our conservation goals?”, the most heartening part of the workshop was a shared sense of community and collaborative thinking . It was encouraging to realise we were working towards an elusive, complicated future but we were working towards it together. I am an MSc student in Biodiversity, Conservation and Management at the University of Oxford with a background and focus in rewilding and inter-species grazing interactions. MSc Biodiversity, Conservation and Management student at Oxford University - Interested in Nature-Based Solutions, Conservation Finance and Restoration.